TalkandPolitcs…..Bloomberg wants to run…..The Dog adds why he won’t make it….. This from a top NY Political Consultant in Team Bloomberg. 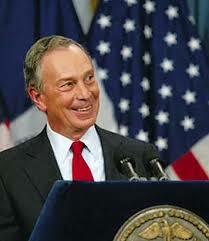 If he sees an “opening”, Mayor Michael Bloomberg may decide to run for President in 2012. As for funding – Bloomberg could “easily spend $1 billion” on an independent campaign. Mike Bloomberg spent $130 million to win the New York City job by about 3% points…. And he’s an ex-Democrat, who dances with the GOP ….but claims he’s a Independent…. Being rich gets him a place at the table…..That’s all.. Being anti-gun means he won’t win in the South and West….. Independents don’t get very far running for President in this country even if they have a shitload of money…. The guy ran it out in New York City buying a third term…. There are just too many people for him to make it outside New York…. TalkandPolitcs…..Bloomberg wants to run…..The Dog adds why he won't make it…..